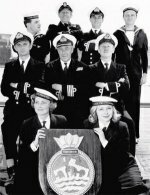 The Navy Lark was a BBC Home Service comedy show that tickled people pink throughout the 1950s. Filmed in CinemaScope and running three times its normal length, it's a nostalgia trip for those who remember and a completely baffling experience for those who don't. The idea was to show naval life as a jolly jape, so the plot deals with life aboard a mine sweeper whose skipper invents an outbreak of yellow fever. What follows is wrapped up in Carry On-style puns and saucy seaside postcard situations.